Huddersfield Town has officially become the first team to be relegated from the Premier League this season. And only the second in league history to secure that distinction after 32 games. 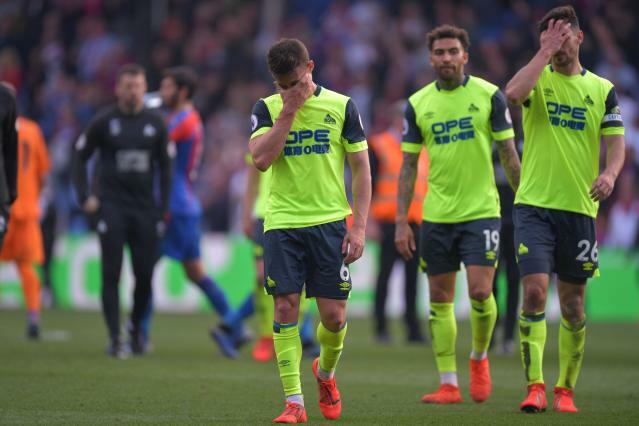 A 2-0 loss to Crystal Palace, coupled with other results from Saturday, doomed Huddersfield to the drop and English ignominy. Only once before has a team been relegated from the Premier League in March, back during Derby County’s infamous 2007-08 campaign. The final nails in the coffin started with a penalty conceded by Juninho Bacuna in the 76th minute, when his late sliding challenge took down James McArthur. Despite the result, Huddersfield could have held on to the thinnest of hopes had other results gone their way. But Burnley’s 2-0 win over Wolverhampton Wanderers and Southampton’s 1-0 win at Brighton & Hove Albion conspired to send Huddersfield down. Not much has gone right for Huddersfield this season. German-American manager David Wagner, whose wizardly work saved a side that had no place staying up last season, was sacked mid-January, and the sheer lack of top-flight talent shackled replacement boss Jan Siewert in the weeks since. Huddersfield actually did avoid the record for earliest relegation in terms of days, as Derby sealed its drop in 2008 on March 29, while Huddersfield did so on March 30. The Terriers also have 14 points, which means they’ll avoid Derby’s record for fewest in a Premier League season with 11. So they can celebrate that if they so choose. That’s about all there is to celebrate for Huddersfield now.